A child who saw his super-rich parents killed in front of him in a seemingly random act of violence, who then swore vengeance and forged his body into the ultimate fighting machine, and uses his vast fortune to secretly bankroll his crusade against all crime while patrolling the city streets at night in a dark, intimidating costume? It'll never catch on! Back in the '90s, comicbooks were still sold at newsstands, not just through the direct market; so if publishers wanted to remain competitive, they had to keep track of what was popular with the world at large, not just what they could convince their existing audience to buy. Tom DeFalco, being a good editor-in-chief, asked Marvel's newsstand distributor what magazines were popular. Usually one grown old man asking another grown old man how to attract the attention of teen boys ends badly, but in this case, the distributor told him that skateboarding magazines were totally fresh. Tom got a few, looked through them, and decided to base a new character on them. Well, new"ish," at least. Thrash wears a suit of armor, like a non-flying Iron Man or a skinnier Vault Guardsman. 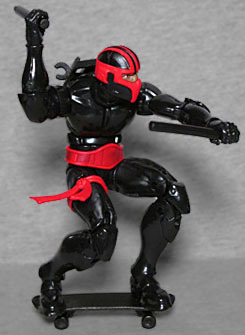 Cleverly, the figure reuses Beetle's blocky chest and shoulders to make it clear this is some kind of metal, not just shiny black spandex or leather. 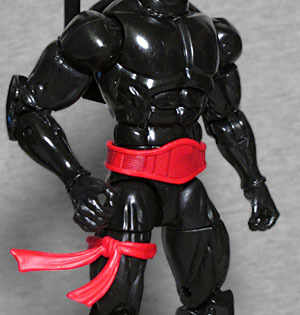 The arms and lower legs come from Taskmaster, meaning the only standard parts remaining are the thighs and pelvis. You may not notice those, though, because of his big red belt and the random bandana he has tied around his right leg. Seriously, it's a suit of armor: what purpose does tying ribbons to it serve? It can't be an emergency bandage, because that would be like putting a band-aid on your car door, and if he just wanted some kind of stylish element there, he could have designed it into the armor. We often joke that characters wearing full-face masks look like they're getting ready to play paintball, but Night Thrasher's helmet totally looks like a paintball mask. 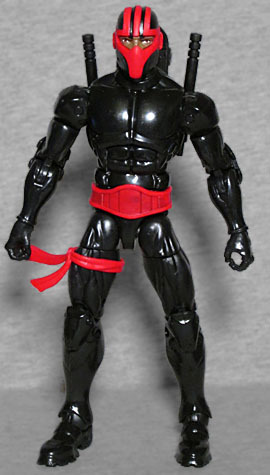 It's mainly black with a red mask over the mouth and around the eyes. The little bit of skin we can see is a separate piece inserted into the head, creating a nice sense of depth. The articulation is on par with the average Marvel Legend - head, neck, shoulders, biceps, elbows, wrists, chest, waist, hips, thighs, knees, feet and, since there's no space for shin swivels thanks to the sculpted leg armor, a swivel at the top of the ankle instead. Works out really well! Since the belt is a separate piece, it gets in the way of the waist a little bit, and the bandana was molded just slightly too large for the leg, so it'll fall if you don't have it positioned just right. Still, he's a martial artist, and the important thing is you'll be able to put him in all sorts of combat poses. 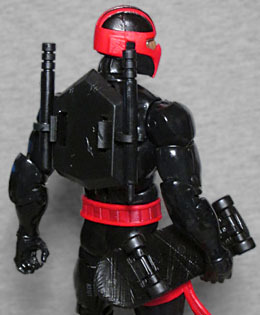 Night Thrasher's accessories are as recycled as his sculpt. He fights with escrima sticks, so he gets the billyclubs that so many Daredevils have carried before him, but he doesn't get the holster on his hip; instead, since the Beetle body had holes in the back to accommodate wings, he gets a new backpack that plugs in there and has clips to stow them on the sides. It also has tabs to hold his other accessory/primary means of transportation, a skateboard. This piece comes from that movie Spider-Man no one ever saw anywhere, though this time it's molded in black to match his colorscheme. Since Dwayne "The Night Thrasher" Taylor is part of Spider-Man Marvel Legends Series 8, he gets a piece of the Kingpin Build-A-Figure. That big left leg is shockingly white next to all the black costume and accessories. Night Thrasher is not the only member of the New Warriors who has a Marvel Legend - no, Vance Astro doesn't count, but remember that Nova was part of the team, too. Still, we need more of them. Thrash might have been created solely to cash in on a hot trend, but it worked: he (and the New Warriors comic) really did become very popular at a time when any book that didn't have an "X" at the start of its title was almost an afterthought.